Woah! Hang on a minute there! Don’t you know we don’t have Christmas jumpers in our house?! This is what I thought, but I didn’t say it out loud. I had a word with myself and thought, well why not? Just because they seem a bit silly and naff and a waste of money and you can’t wear them in October or February (or July!) and they didn’t have them in ‘my day’ or when the boys were little, is there really a good reason not to get a Christmas jumper? And there really wasn’t one that I could come up with. But where to get a Christmas jumper from? And how to steer my daughter subtly away from the tat? Regular readers will know I am a big fan of Next. I’ve seen they have some nice Christmas jumpers, but they seem a bit expensive for something which can only be worn for a few weeks. At the other end of the scale there’s Primark, which seemed a bit too glitzy and in your face for my liking. 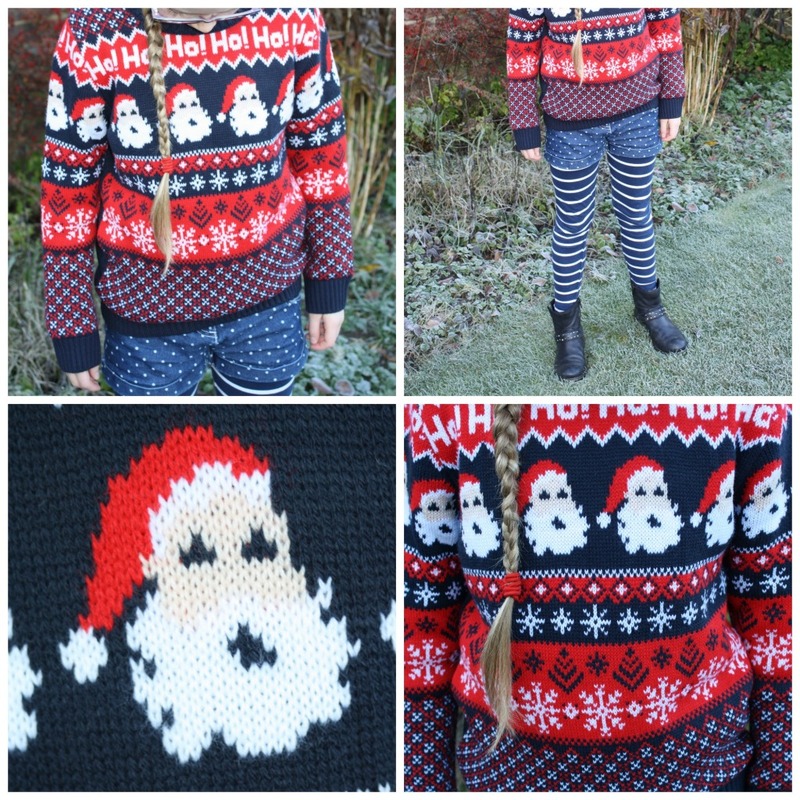 If my daughter was going to get a Christmas jumper, it would be a CHRISTMAS jumper. It wouldn’t feature a polar bear with a scarf on or a penguin with a sparkly heart. BECAUSE POLAR BEARS AND PENGUINS AREN’T CHRISTMAS. They’re winter (or specifically the Arctic and Antarctic), which is another matter entirely. Christmas is Santa, reindeers and snowmen (yes, I know you could argue snowmen are winter too, but I’m arguing that they are also Christmas). So where to get the jumper? We went to Asda, which is somewhere I don’t go very often, to get a cake for my son and they had a good range of Christmas jumpers. Yes, there was a proportion of the jumpers I wanted to avoid like the plague. But there was also this. It ticked all the boxes. Kind of traditional and definitely not glitzy and not a polar bear or penguin in sight. It was also a boy’s jumper. But I’m pleased to say my daughter is beyond the age where she wouldn’t touch a boy’s jumper with a barge pole. I’ve taught her well and she’d much rather an understated boy’s jumper to a piece of girly, sparkly tat. My daughter loves her jumper and everyone who meets her loves it too. She’s rocking it with the Sainsburys shorts and leggings she wears pretty much constantly and the Clarks boots. Thanks very much, I really like it too. I must say this is the first year I’ve been slightly tempted, although I haven’t done it! Great jumper and it looks fab with the short and leggings. Merry Christmas!